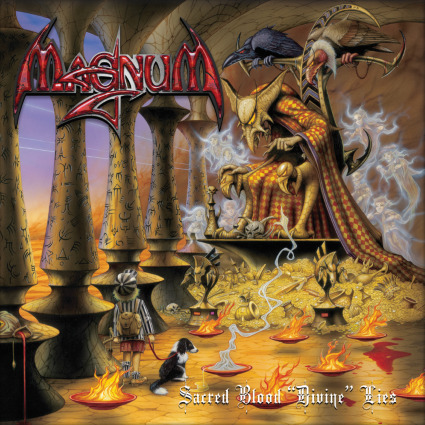 Review: "Magnum: Sacred Blood" - Sea of Tranquility - The Web Destination for Progressive Music! I know I've said this before, but one of rock's biggest mysteries has long been how British act Magnum just never failed to catch on here in North America. Long beloved in their home country as well as many other parts of the world, this veteran act still are relatively unknown here, and with a career that goes back to the '70s across many spectacular albums, it still remains a puzzling head scratcher that Magnum aren't a global phenomenon. Sacred Blood "Divine" Lies is the latest in a long line of stellar releases from the band, as they mix hard rock, pop, and prog into a swirling, melodic pot of sumptuous sounds, tones, and colors. Perhaps a tad more hard rocking this time around, Sacred Blood "Divine" Lies still contains those glorious melodies, those fine vocals from Bob Catley, and the majestic keyboard tapestries courtesy of Mark Stanway, but it's the beefy riffs and sizzling lead solos from Tony Clarkin that really stand out here, giving many of these songs, even the ballads, some serious edge and fire. "Gypsy Queen", "Crazy Old Mothers", and the irresistible title track provide for plenty of head banging moments, and Clarkin's insistent power chords drive the otherwise pomp/prog of the enchanting "Princess in Rags (The Cult)". Images of Queen at their most epic pop up on the mesmerizing "Afraid of the Night", and the crushing "Quiet Rhapsody" rocks hard in grand Deep Purple or Black Sabbath fashion. Fans of Catley's trademark vocal harmonies will love his work on the engaging "Twelve Me Wise and Just" as well as the tender ballads "Don't Cry Baby" and "Your Dreams Won't Die". There's nothing quite as majestic, classy, and grandiose as a Magnum album, and yes, they've hit it out of the park once again with Sacred Blood "Divine" Lies. This is melodic hard rock with a touch of prog the way it ought to be, and judging by the string of wonderful albums this band have cranked out here late in their career, there seems to be no slowing them down anytime soon. Cheers to that...keep it coming guys! Listened to the new Magnum album after Pete's glowing review. I could not believe how generic and uninteresting this album is. The arrangements are so predictable and uninspiring. The often trite and repetitive vocals stifle any real exciting musical action. I was thinking whilst listening to this album on headphones and without distractions, where is the adventure and sizzling guitars that Pete mentions. Inventive arrangements are one of the few ways that musicians can breathe new life into often cliched musical forms. Having heard Spock's Beard's brilliant 'A Better Way To Fly', the Neal Morse Band's' The Call', Bowie's 'Blackstar' and The Enid's new track 'Trophy' recently, well I must be honest and say that this Magnum album pales badly in comparison. Seriously four and a half stars for this one paced, unexciting and pedestrian album is being exceedingly kind. It really points to why this band have never really hit the big time. Real music fans who listen to a wide range of interesting music whether it be Zappa, Radiohead, Gentle Giant or XTC know when a band just doesn't have the musical inventiveness to cut it. Incidently, last year 3Rdegree album 'Ones and Zeros' is a great lessson in making clever, thought provoking intelligent and well arranged melodious pop/rock music.